Chicken Cordon Bleu is an American dish made out of pounded breast pounded and rolled around ham or Prosciutto and a cheese which is breaded then either fried or baked. There are several European dishes nearly similar to this that had originated on an earlier time but this specific combination was believed to be invented somewhere around 1960’s. There are two nearly similar dishes one is the Chicken Kiev where veal is wrapped around seasoned butter, dipped in a batter and deep fried and another one is a Swiss dish where veal is wrapped around a thinly sliced ham and Gruyere cheese, dipped in a batter and deep fried. In New Zealand you can see a lot of these served in take away shops and even in the frozen section of the Supermarket, I tried some of them and did not enjoyed it compared to when I first tasted this in the Philippines. They all taste like stale oil especially the takeaway bought ones and the chicken texture is not as what I had expected so it ended up me making my own at home, it is baked not deep fried and here are the recipe and results for you to enjoy! In a bowl combine parsley, bread crumbs and freshly ground black pepper. Pan fry bacon until cooked and browned but not crispy, set aside in a paper towel lined plate. Lay out pounded chicken breast on a surface, season it with salt and pepper. Place bacon on top then a slice of cheese. Roll the chicken around the filling then secure with toothpicks. Dip roll in flour, then in olive oil then in bread seasoned bread crumbs. Place in a wire rack over a shallow dish. Bake in a 185C preheated oven for 45 minutes or until chicken is browned. nice rolled up chicken meat, the name of the recipe is superb. I totally understand you… Tasting something far from satisfactory and then trying to make a better version at home. Your cordon bleu looks juicy and delicious. I would also prefer chicken (I am not a very big fan of veal). Homemade is always nicer and healthier too. Your cordon bleu looks great. Great info, I always figured it was a French dish that we ruined, ahem made our own! I love this dish and this recipe. Great post. Ah, the stuffed and breaded chicken breast is so versatile! This looks delicious, when’s dinner?! I haven’t had chicken Cordon Bleu in such a long time.. but this looks so delicious I may have to try it out sooner rather than later. And I never knew it was an American dish..
I’ve tried making this once but failed…I just couldn’t get the chicken to cook correctly. The outside would get cooked too fast and the inside still raw…ugh! 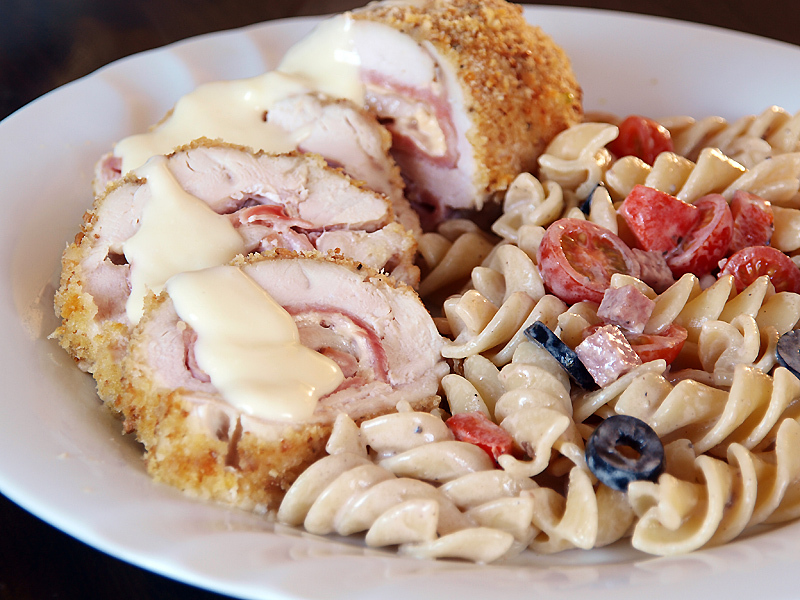 I had never heard of cordon bleu but this looks really good! What a lovely comfort food with pasta… I love everything with breadcrumbs. It’s so hard to stop eating once I start…. dangerous but yummy! Baking it makes it such a healthier option – great idea ! It’s been ages since I have had Cordon Bleu, you got me wanting to make Cordon Bleu. Thanks for sharing a great recipe. You always have new and exciting dishes here, I like the presentation of this Cordon Bleu. We usually have this during Christmas and new year. I haven’t had this in ages – forgot it existed until I saw this post. Now I want it! Yum! Do you have a recipe for the pasta salad also? Ummm Cordon Bleu IS French..(as in the language, translated to ‘blue ribbon.).. Yes it (the dish) has been adapted in many ways with different meats and cheeses etc but calling it an American dish? Questionable.